Eastwood’s Bar, dubbed as the “Living Room of Uptown,” opened in spring 2016 as a neighborhood bar with creative craft cocktails, an elevated food menu and a dog-friendly patio. This fall, Eastwood’s added a collection of new cocktails, many with house made ingredients and innovative twists, as well as a variety of new menu items showcasing American cuisine. Many have come to Eastwood’s for its inviting and relaxed atmosphere with multiple TVs to catch your favorite sports games, a spacious dog-friendly patio, live music and weekly specials. The bar is also home to Kansas State, Clemson and Baylor college football watch parties. While the drink menu boasts an array of local brews, wines and various libations, the Eastwood’s owners Chris Johnson and Pablo Ramirez have put their personal spin on classic cocktails in the new menu: unforgettable mules, bold boilermakers and visually-appealing artisanal concoctions. Many of the new cocktails include house made ginger beer and syrups to evoke stimulating sips. Eastwood’s Rare Old Fashioned – Eagle Rare Bourbon, Eastwood’s proprietary smoked pecan complex with a twist of citrus. 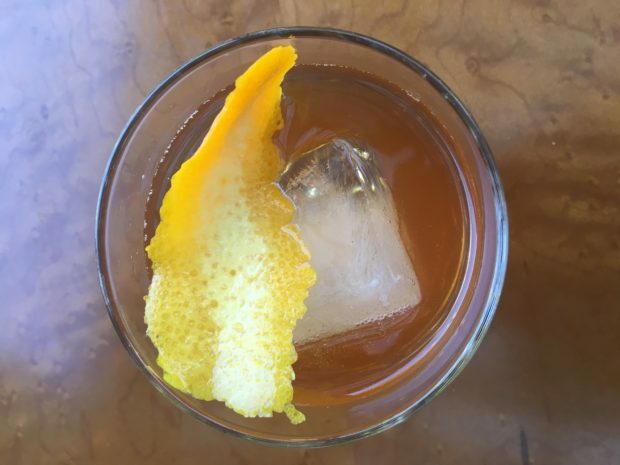 The smoked pecan complex adds a layer to the old fashioned that will have you craving more! Bar bites have a whole new meaning here at Eastwood’s. The menu includes shareable appetizers, such as the Tot-Chos, Eastwood’s famous Parmesan and truffle tater tots with pimento cheese queso. 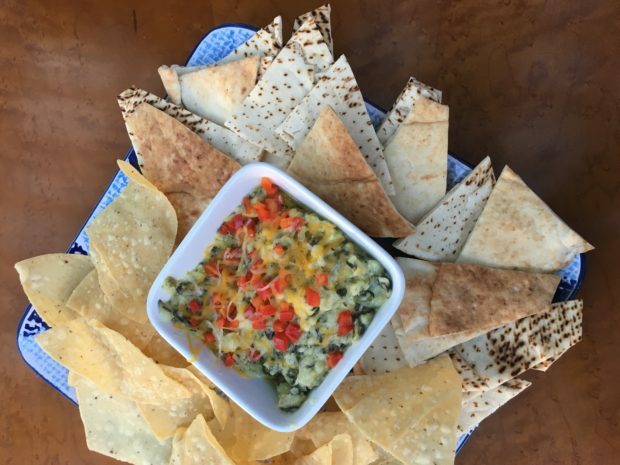 Another wonderful shareable dish that pairs well with your craft cocktail or beer is the Spinach Artichoke Dip topped with melted cheeses and accompanied by house made tortilla chips and pita bread. This isn’t your average dip, either! The Eastwood’s Burger is a massive 1/2 pound patty served on a brioche bun with Gouda and provolone cheeses. 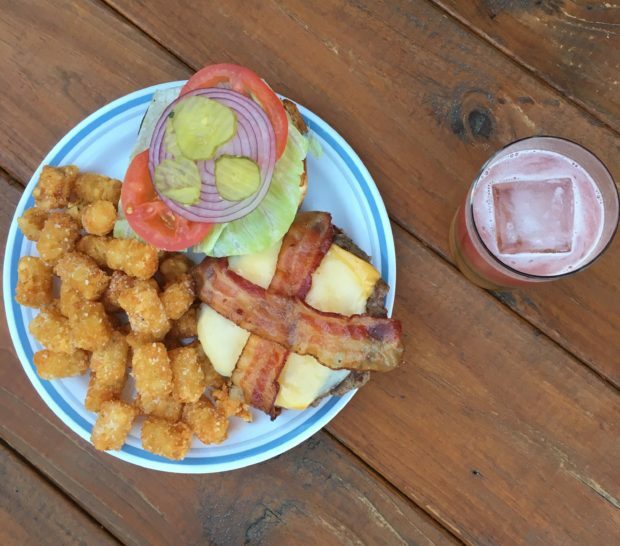 Throw on some bacon, lettuce, tomato and pickles and you have yourself one heck of a burger! Not to mention, those truffle and Parmesan tots are to die for! Extra crispy and packed full of flavor, you don’t need ketchup for these! Paired with a New Dallas Sour – Old Forester Bourbon, fresh lemon and a red wine floater. Diners can also experience lighter items like the vegetarian hummus wrap and several hearty salads. Additional cuisine, such as the newly-added tacos and wings, wholesome sandwiches, burgers, delectable sides and a Nutella-infused dessert, are sure to win over hearts and taste buds. New at Eastwood’s, guests will enjoy a new take on classic brunch entrees including the Uptown Churro Waffles, Fireball French Toast and the Mimosa Parfait. 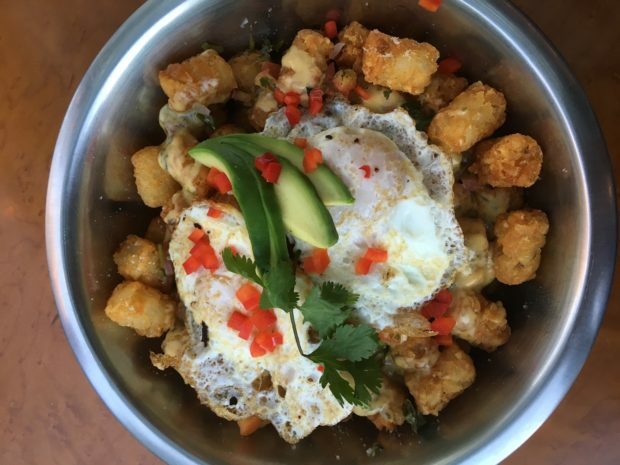 The brunch menu also includes savory drink options and two food choices for dogs. Eastwood’s Bar is open daily for dinner, Fridays for lunch, plus weekend brunch. A separate BBQ menu is available on Saturdays during brunch hours as well. Weeknight specials include happy hour (Monday through Friday from 4 to 8 p.m.), Ladies’ Night (Wednesdays) and Geeks Who Drink Trivia (Thursdays at 8 p.m. with extended happy hour until 10 p.m.). Free valet is available next to the bar. Eastwood’s Bar is located at 3407 McKinney Ave, Dallas, TX 75204. Connect with Eastwood’s on Facebook, Twitter and Instagram at @EastwoodsUptown and the hashtag #eastwoodsuptown. My meal was complementary and my thought, opinions and photos are those of my own.